THE AUSTRALASIAN PERFORMING RIGHT ASSOCIATION (APRA) AND THE AUSTRALIAN MUSIC CENTRE (AMC) HAVE ANNOUNCED THE 2011 WINNERS OF THE INAUGURAL ART MUSIC AWARDS IN THE GENRES OF CONTEMPORARY ART MUSIC, JAZZ AND EXPERIMENTAL MUSIC IN A SLEEKLY ENTERTAINING CEREMONY AT SYDNEY THEATRE DROLLY HOSTED BY JULIAN MORROW, PEPPERED WITH SOME FINE LIVE PERFORMANCES AND FRAMED BY DIGITAL IMAGERY THAT KEPT US IN TOUCH WITH CATEGORIES AND PRECISELY WHO WAS WHO. It was gratifying for the RealTime Editors to see Queensland’s Clocked Out (Erik Griswold, Vanessa Tomlinson) and Western Australia’s Cat Hope honoured with awards. These are artists whose work we have long admired and featured. The Performance of the Year Award went to soprano Jane Sheldon and the ever inventive Ensemble Offspring conducted by Roland Peelman for their collaborative project, The Origin Cycle. Sydney-based composer Paul Stanhope won Instrumental Work of the Year for his String Quartet No 2 and Vocal/Choral Work of the Year for Deserts of Exile from his Exile Lamentations choral cycle performed by the Choir of Trinity College. Orchestral Work of the Year was awarded to James Ledger’s Chronicles performed by the West Australian Symphony Orchestra conducted by Paul Daniel. 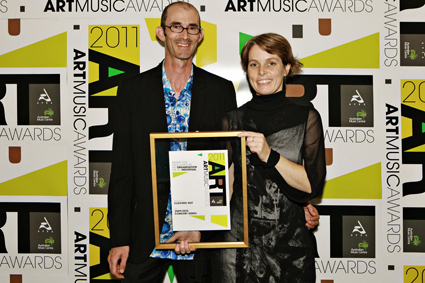 The WA winning streak was confirmed by Johannes Luebbers who received the award for Jazz Work of the Year for his big band work Ashes to Ashes, performed by the Johannes Luebbers Dectet. Other award winners included Michael Kieran Harvey who received the Tasmanian State Award for his homage to Frank Zappa, 48 Fugues for Frank, and recorder virtuoso Genevieve Lacey who took out the Victorian State Award for Performance of the Year for her multimedia creation, En Masse. The Award for Distinguished Services to Australian Music was shared between Patrick Thomas and John Hopkins. Thomas recalled a long career, commencing as 3rd flute at 14 years of age, looked back fondly to the Modern Music forum he established in Brisbane with Tony Gould and going on to conduct some 110 works by Australian composers, quipping “nor just first performances!” As a young concert-goer in Adelaide. I was always impressed with Thomas’ commitment and the calibre of his conducting. Unfortunately, he was a casualty of the reforms of the mid-1980s when the ABC was divested of its orchestras. Some compensation comes with the imminent release of an eight-CD collection of his performances as conductor. John Hopkins was also appreciative of the best years of the ABC in the era of conductors Joseph Post and Bernard Heinze (whom I recall gently lecturing a restive Adelaide Symphony Orchestra audience about the meaning and sounds of Peter Sculthorpe’s Sun Music). Thomas remembered the pleasure of conducting the music of Sculthorpe, Penberthy, Brumby and others, while Hopkins treasured the particular memory of Richard Meale conducting Nigel Butterley’s Laudes and Butterley conducting Meale’s Floridas in an exciting time for Australian music. As the Art Music Awards indicate, now is another such time.